Just when you think you’ve had enough with pests munching on your landscape …along comes one more! I’m always surprised in August when I see the first Orange-striped Oak Worm. In my mind, they have become harbingers of cooler weather ahead. 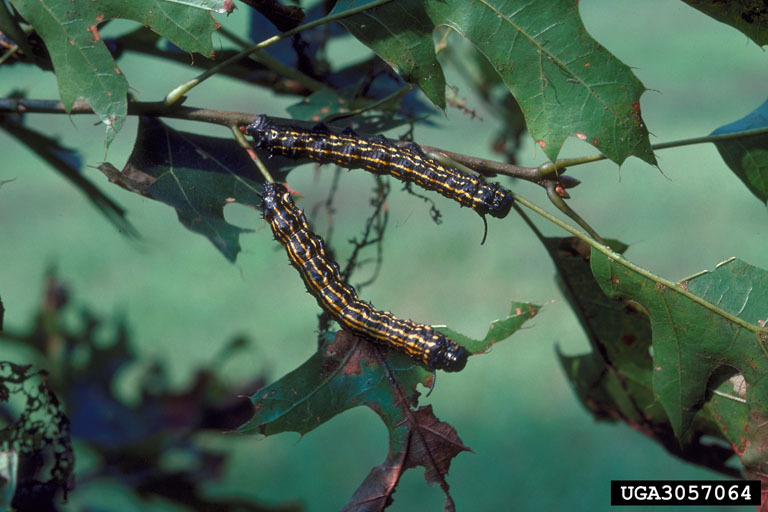 Orange-striped Oak Worms have one generation per year. Adults (moths) emerge and lay clusters of yellow eggs on the bottom of oak leaves. Young caterpillars are yellow and feed gregariously, skeletonizing leaves, leaving most fine veins intact. As they grow, larvae become black with increasingly noticeable orange stripes. Large larvae can consume entire leaves, leaving only the mid-vein. 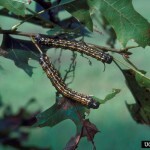 These caterpillars can partially or entirely defoliate trees, but often only one or two branches are affected. Later they’ll start crawling down trees to the ground looking for pupation sites in soil and leaf litter. By that time though, they are usually about done feeding for the year so treatment is not warranted. “Mark Coffelt and Pete Schultz studied this critter at Virginia Tech in the 1990’s. They looked at the life cycle, damage, parasitoids, and developed a sampling plan, aesthetic injury level, and threshold for taking action to reduce further damage. Fellow gardeners reinforce my philosophy that one doesn’t have to reach for the sprayer every time a pest takes a bite out of one of our plants. Particularly if those plants are mature, well-established trees.